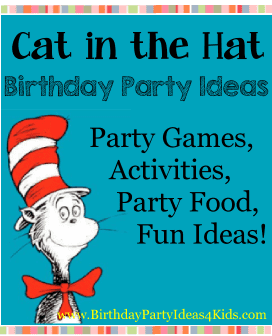 Cat in the Hat birthday party ideas will bring the fun of the Cat in the Hat Story books to your birthday party. A perfect birthday party theme for boys and girls of all ages! The Cat in the Hat birthday party theme is also a favorite for 1st birthday parties. 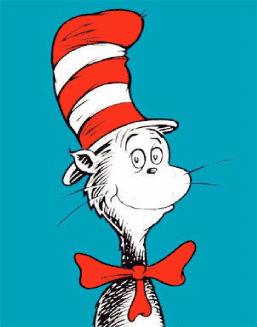 Ask guests to bring a Dr. Seuss book to the party for the birthday child. Teams must run a relay race while balancing items on a tray. Before the party gather two circular trays and items for the children to balance. Empty 1/2 gallon milk cartons, blocks, a cup filled with water, etc. are good things for them to try and balance. At the party set up a relay course with a cone or marker for them to run around before they can run back to their team. Divide guests into teams. Line up behind the starting point. Have them stack the items on their tray. On "go" the first person from each team must carry the tray (with one hand) to the cone and then back to the starting line. They then hand off the tray to the next child in line. If they drop the items from the tray or if the items topple they run back to start, stack the items again and start over. First team finished wins. Set up several fish bowls on the ground at different distances from the playing line. Give each bowl a point value. Have party guests stand behind the playing line and one by one give them 3 - 5 ping pong balls to throw into the fishbowls. Keep score and give prizes to the guest with the highest score. This is a fun relay type game. The object is to see which team can fill up their fishbowl the quickest. Before the party buy two fishbowls (or buckets) and write on them "Fishbowl 1" and Fishbowl 2". In the backyard or park set up the fishbowls on a sturdy surface about 30 yards from where the teams will line up to begin the game. At the starting line fill up a large tub with water. Take 2 plastic drinking cups and poke several holes in each one. Make sure that when they are filled with water the two cups leak at the same rate. During the party - line the two teams up at the starting line and tell them they will have to one at a time dip their cup into the water and then run to the fishbowl and empty it into the fishbowl. Tell them they are not allowed to plug up the holes on the bottom of the cup. The first team to fill their bowl to overflowing wins! Set up a treasure hunt that will lead the party guests to find the items in the Cat in the Hat book such as a tea cup, ball, book, goldfish bowl, etc. Have the birthday cake be the last item they have to find. See our treasure hunt page for ideas, set up and instructions. Make bases out of paper or different objects from the Cat in the Hat book such as a teacup, books, toy boat, red fan, umbrella or a ball - or simply use red cushions or circles of red and blue fabric. Players can use the bases to be "safe" for 10 seconds at a time. When a child gets tagged they must freeze in that position until they are unfrozen by another player. When “it” freezes everyone they get to pick the next “it”. Red and white striped note cards - write party information inside with a red marker and fill with red and white confetti. Fill out party information on solid red note card and then tie a white and blue ribbon around the card in a bow. Make bows out of red satin ribbon and glue to the front of white note cards. Glue red boa feathers on the side of white or blue note cards. Print out and color the Hat from the Cat in the Hat books and glue onto note cards. Tie red and white helium balloons to the mailbox. Hang kites in the trees. Cut out paw prints from construction paper and tape them down on the driveway and walkways leading to the party (you can also draw them on with sidewalk chalk). Decorate the party table with a red or white tablecloth and black or light blue flatware, cups and plates. Use red and white striped straws in the drinks. For a centerpiece place some of the items that the Cat in the Hat balances in the book - teacup, rake, 3 books, fishbowl, cake, toy boat, red fan, umbrella and a ball. Make a quick and easy Cat in the Hat themed banner above doorways and along mantles and stairways by alternating red and white balloons. The balloons make it look festive and it is an easy and inexpensive way to make a white and red striped banner. Wrap red and white streamers around columns and railings for the same look. Cut strips of white & red construction paper from 11"x 17" paper lengthwise. Staple or glue the strips together alternating white and red. Glue 8 to 10 together and then put ends together to form a tube and fit them on the party guests heads. Staple the sides together for a tall Cat in the Hat .. hat. Set up several kites before the party and give each party guest an opportunity to fly one of the kites. Cookies decorated with white & red icing. Red and white polka dotted bandana - place party favors on the bandana and tie up the ends.